In order to have a fireplace that is operated safely within the home one must have the proper tools and accessories. There is no sense in having a fireplace if you are not going to be able to use it, and the only proper way to use it is to keep it safe. That is where the Fiona 3 section black firescreen can come in handy. This particular firescreen is made of only the highest quality materials and can be used with a solid fuel, gas, or electric fireplace just the same. It is such great material that it can handle any of those fireplace types. You might find yourself interested in this firescreen when the winter starts to come along and you want to be in front of the fire as much as you possibly can. That is the best way that you can have the full fireplace experience that you have always dreamed of. 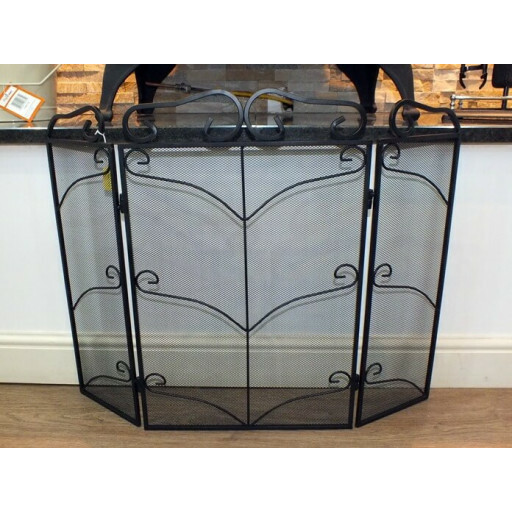 It is within your reach if you go ahead and purchase this Fiona 3 section black firescreen for your own home. You will not regret it when you place it up in front of your fireplace and see how great it looks. Middle panel: 25" x 16"
Side Panels: 25" x 7 1/2"